Preheat oven to 400°. Grease muffin tin or use paper liners. Pour vinegar and dairy-free milk into small bowl or measuring cup. Set aside. Combine first 8 ingredients through chocolate chips in large mixing bowl. Stir together pumpkin puree, sugar, molasses, vanilla, flax mixture (egg replacer) and milk/vinegar mixture in a small(ish) mixing bowl. Add wet ingredients to dry. Gently stir until combined. Divide batter into muffin tin. (I use a measuring cup.) Top with sliced almonds and coconut chips (optional). Bake for 30-35 minutes or until inserted toothpick comes out clean (hard to avoid chocolate chips though). (written after muffins made and eaten) These taste nothing like the Almond Joy Granola or the candy bar (from what I remember). 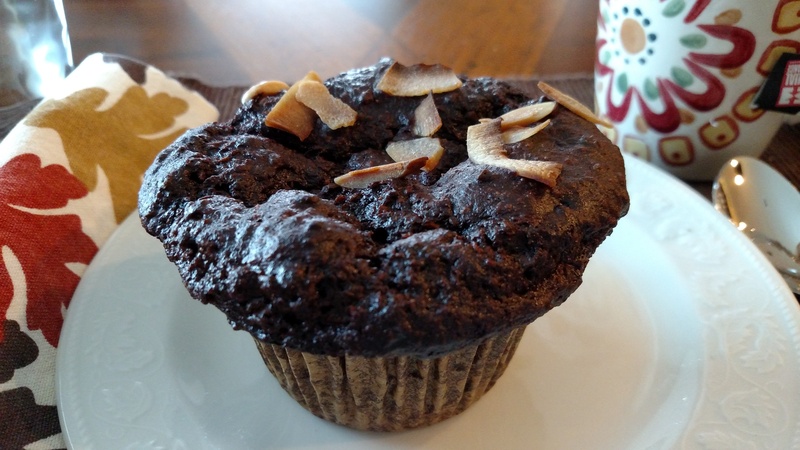 These muffins are super chocolaty with coconut and almond accents. I’ll probably try again for a more pronounced coconut flavored muffin, but for now I’m happy with chocolate! I made these muffins last night. After they had been baking half an hour, I turned off the oven and left them in there overnight. This morning I served my (wary) children, each half a muffin. One picked the coconut off of the top and left the rest crumbled on her plate. My other child didn’t leave a crumb. So a mixed review. I thought they were yummy. Gluten free, dairy free,vegan, high fiber, what is not to love? I’m thinking I’ll have another one for snack. Is it snack time? « Is It? Is It Here? FALL! WOW! I can’t believe these are GF AND DF!! !